Monarch Air Group provides private air charter in South Bend. Our clients benefit from top-notch service, unrelenting dedication to safety, wide selection of aircraft, and years of experience in chartering private jets. To obtain a free quote, please use our online quoting tool provided below, or call toll free 1-877-281-3051. Monarch Air Group provides private jet charter flights in and out of South Bend, Indiana, USA. South Bend is the fourth largest city in Indiana and the county seat of St. Joseph County. It is also the economic and cultural center of the Michiana region. The city’s economy is mainly based on health care, small business, education, and tourism. South Bend is home to such large corporations as AM General, Honeywell, and Crowe Horwath. 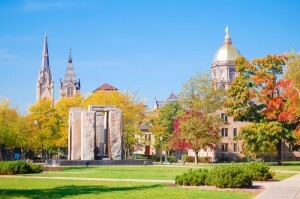 The most popular tourist attractions in South Bend include South Bend Museum of Art, Studebaker National Museum, Morris Performing Arts Center, Museums at Washington and Chapin, Potawatomi Zoo, and many others. The city is served by South Bend Regional Airport (SBN / KSBN), which is located 5 miles from South Bend. 1. ANQ, Tri-State Steuben Cty, Angola, United States. 2. AZO, Kalamazoo/Battle Creek Intl, Kalamazoo, United States. 3. BEH, Ross Field, Benton Harbor, United States. 4. BTL, WK Kellogg Regional, Battle Creek, United States. 5. EKI, Municipal, Elkhart, United States. 6. GSH, Goshen, Goshen, United States. 7. GYY, Gary/Chicago International, Gary (IN), United States. 8. HAI, Dr Haines, Three Rivers, United States. 9. IRS, Kirsch Municipal, Sturgis, United States. 10. LPO, Municipal, Laporte, United States. 11. LWA, South Haven, Michigan, United States. 12. MGC, Michigan City Arpt, Michigan City, United States. 13. NLE, Jerry Tyler Memorial, Niles, United States. 14. PLY, Plymouth, Plymouth, United States. 15. RCR, Fulton County, Rochester, United States. 16. SBN, South Bend Regional, South Bend, United States. 17. SMD, Smith Field, Fort Wayne, IN, United States. 18. VPZ, Porter County, Valparaiso, United States. 1. Inn at Saint Mary’s Hotel and Suites, 53993 Indiana State Route 933, South Bend. 2. Magnuson Grand Hotel South Bend, 213 West Washington Street, South Bend. 3. Inn at Saint Mary’s Hotel and Suites, 53993 Indiana State Route 933, South Bend. 4. Magnuson Grand Hotel South Bend, 213 West Washington Street, South Bend. 5. Holiday Inn Express Hotel & Suites South Bend, 120 North Dixie Way, South Bend. 6. Inn at Saint Mary’s Hotel and Suites, 53993 Indiana State Route 933, South Bend. 7. Magnuson Grand Hotel South Bend, 213 West Washington Street, South Bend. 8. Holiday Inn Express Hotel & Suites South Bend, 120 North Dixie Way, South Bend. 9. Inn at Saint Mary’s Hotel and Suites, 53993 Indiana State Route 933, South Bend.